Americas Cardroom, a US facing online poker room, is giving bitcoin poker players the opportunity to convert their bitcoins into an enormous prize of $200,000 by taking part in the Million Dollar Sunday, a Texas Hold’em tournament with a guaranteed prize of $1 million and a guaranteed first-place prize of $200,000. The Million Dollar Sunday that was held at 3:00 p.m. ET on August 2 was the third event of this year to offer a guaranteed prize pool of $1 million. Interested players can either win a free seat by taking part in a satellite or buy-in with bitcoins worth $500+$40. Americas Cardroom, which is located in Costa Rica, launched the first Texas Hold’em tournament with a guaranteed prize of $1 million early in 2015 to attract US poker players and give them their first big poker event after the Black Friday of four years back. Americas Cardroom wants to restore poker to its pre Black Friday days in the US. Many players say that, thanks to the online poker room, it is now easier for them to make deposits and withdraw winnings. This is because US facing online poker rooms heavily depended on credit card processing before leaving the US and relocating to gambling friendly jurisdictions such as Costa Rica. Thanks to the introduction of bitcoins, US poker players can deposit funds and withdraw winnings instantly and anonymously. Bitcoin withdrawals are fast, owing to which players can see their winnings in their bank accounts instantly. In addition, bitcoin is associated with zero transaction fees. As soon as players deposit bitcoins at Americas Cardroom, the online poker room converts them into poker chips bearing real US dollar value. Winners can withdraw winnings either in bitcoins or through any other withdrawal method available at the online poker room. Poker players can deposit as little as bitcoins worth $5 at a time. A $1000 cap is imposed on daily deposits, but players are allowed to deposit bitcoins worth as much as $8,000 per month. Americas Cardroom is a skin on the Winning Poker Network (WPN), one of the most reputed online poker networks in the industry. The online poker room accepts players from all over the world, including the US. It has obtained a high rating for its abilities to process payouts quickly, deliver excellent customer support, and provide a lively and dynamic gaming atmosphere for players from different parts of the world. 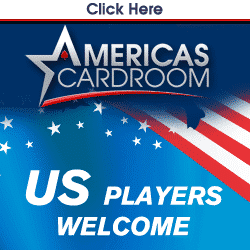 Americas Cardroom welcomes new players with a deposit bonus of 100% up to $1000 on their first deposits.